The Centre is quiet, beautiful and inspiring. Many different groups and individuals seek to contribute to the common good, and all are welcome here. Activists come to recover and renew; many people come for mindfulness training. Artists come here to write, rehearse, paint or simply soak up the atmosphere. Students come to study away from distraction. Regularly we welcome travellers, and many nationalities have enriched the Centre with their contributions. As we are situated right on the Bibbulmun track, lots of walkers stop here to rest. In 1983, the property was generously donated to Origins Centre, a WA group interested in Buddhist ideas and practices. Although retreats and Buddhist study groups have always been held here, the Origins Centre has now evolved into a universal, inclusive and practical place open to the community. Through the years the Centre has welcomed many groups exploring a variety of subjects including environmental activism, art workshops, bush regeneration, mental health, care, youth and children's education and play. To learn more about our facilities, please follow the link below. We teach and support regular Mindfulness practice for the protection, maintenance and development of mental health. Origins respects mental health and the effort it can take to maintain and protect it. We are a non-clinical service and long-standing supporters of mental health. One of our main purposes is to provide a friendly, safe, restful environment where people can enjoy good company and renew themselves. These understandable exercises are meditative. They are called 'The setting up of mindfulness'. Considering the meaning, one could say that all we do is for the encouragement and protection of mindfulness! There's a retreat in May and again in September. Check out the Updates. Activities at The Centre may include: yoga, meditation, workshops on wellbeing, respite for carers, bush walking, support for activists and environmentalists, personal study or retreat, art, music or concerts and, increasingly, Landcare. There is a pot luck lunch with the community every Wednesday at 12:30pm. Maintaining and developing the natural environment is a continuous project here known as Landcare. 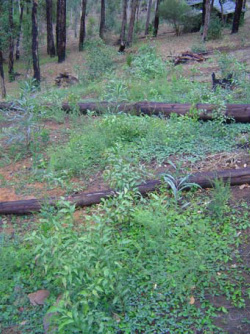 We are learning to a great extent about bush regeneration. It is a real interest to those involved and requires real labour! The diversity and accessibility of our parkland is always improving. Since our founding, children have been very much a part of our cultural fabric. Many kids and parents have taken a break at the Centre. The Origins Centre is governed and run by a voluntary local management group with the indispensable help of many friends. We are dedicated, like so many others, to furthering the common good. The costs and needs of the Centre have always been met by freely given support (dana), whether as labour, in-kind, financial donations or fundraisers. We have also received the occasional grant to help fund a major project like the building of an office or the guest cottage. Accommodation, amenities and all facilities at the Origins Centre are available on a donation basis. Please note that donations are not individually monitored and envelopes supplied give each donor the privacy they may require.